During the war, Indian made aircraft engines, motors for boats, air conditioners, and bicycles. Perhaps the most revered Indian Scout motorcycle was the 1928 101 Scout, with its lower slung frame and improved handling. The Indian Scout was introduced in 1920. It had a 37 cubic inch (596 cc) engine that increased in size to 45 cubic inches (745 cc) in 1927. That increase in engine size was an answer to the popular Excelsior Super X, which was the first American 45 cubic inch motorcycle. A second response was the 1928 introduction of the 101 Scout, which some fans consider to be the height of Indian Motorcycle technology. 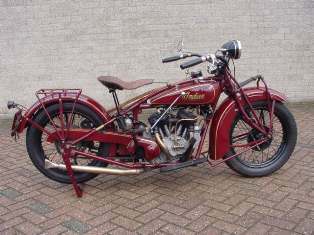 There remain, however, enthusiasts who are pleased with Indian’s use of the frame from its other superstar model, the Chief, in the Scout line starting in 1931. Perhaps to placate Scout devotees, from 1932 until 1941, smaller Scouts were built. They were known as the Scout Pony, the Junior Scout, and the Thirty-Fifty, all of which had 30.50 cubic inch engines. In the early decades of the 20th century, the Indian Motorcycle Company and Harley Davidson were the two alternatives for the classic American heavyweight cruiser. The two companies were fierce rivals, and this rivalry is chronicled in the book The Harley-Davidson and Indian Wars by Allan Girdler. While the Scout was a runaway bestseller, Harley-Davidson proved to be a very formidable opponent. One testament to the speed and ruggedness of the 1920 Indian Scout motorcycle was racer Burt Munro’s use of a modified 1920 Scout to set land speed records between 1962 and 1967. Munro’s under-1000 cc world speed record in 1967 still stands. At the time, Munro, a New Zealander, was 68 years old and was riding a motorcycle that was 47 years old. This and other feats were dramatized in 2005 in the movie The World’s Fastest Indian. In 1935, controlling interest in Indian Motorcycles was sold, and production of all Indian Scout motorcycle models halted in 1946. Over the decades, the company changed hands, going bankrupt in 1977. Disputes over ownership of the brand name played out in court throughout the 1980s and 90s. Finally, in December 1998, the claim was settled in Federal court in Denver. IMCOA Licensing America, Inc. was awarded the trademark, and the Indian Motorcycle Company of America was formed as a conglomerate of nine companies. Production began again in 1999, and Scout models were manufactured from 2001 to 2003, until the company went bankrupt again. In 2006, the company re-formed and set up shop in Kings Mountain, North Carolina. Though the Chief model is being resurrected, the Indian Scout motorcycle is no longer made.